Taking negative thoughts and turning them into positive thoughts worked well today. I kept a reminder open on my email and it seemed to work well. A lot of the positive momentum might be temporary and beginner’s luck but I enjoyed “catching” the thoughts and turning them into something positive rather than follow them somewhere dark and negative. The second test, the request to my subconscious seemed to work as well. My request to my subconscious was to have more focus and fewer distractions at work. I had better than average focus and I was able to gently bring my attention back to focus if my mind drifted away. Some of this might be chalked up to “having a good day”. I will continue to apply these two lessons and see where it takes me! The motivation for #1 is to avoid staying in negative thought patterns. I am skeptical about being able to flip negative thought patterns but I am going to try this technique for 30 days. Josh Korda talks about something similar when he discusses replacing an unskillful thought with a more skillful one. The motivation for #2 is to see if there is any benefit to be had from the subconscious working overnight. This type of mental conditioning gave me a lot more conscious control over my internal states. I will report back periodically. I am very excited to try these out! An important speech from Stefan Molyneux. He is at his theatrical best from 7:27 onwards. Speeches are worth nothing without action. It is valuable for thoughtful, intelligent people to voice their well-reasoned beliefs and opinions, especially to those who will disagree. A US drone landed in Iran earlier this month. The Iranians are claiming to have the drone in its entirety. The Iranians recovered the crashed drone or managed to land it and now the US is asking for our spy plane back. Hillary Clinton said “given Iran’s behavior to date, we do not expect them to comply”. The US has bombed and killed 100k+ CIVILIANS in Iraq. That might explain Iran’s distrust of the US and reluctance to hand over the drone. Iran is in possession of a FOREIGN object that landed on their own soil and Hillary Clinton questions their behavior for refusing to give back a drone that was being used against them? What would be our reaction if China sent a drone over one of our cities? What if it crashed in a major city? Would we return it? What would the collective reaction be? Is Obama anymore tactful than Bush by asking for a piece of spy equipment back? Do Obama supporters really believe he is different on foreign policy than Bush? Is the expense of building, flying, crashing unmanned drones worth it? 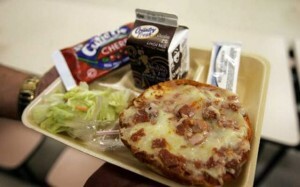 This government funded meal of pizza, cherry pie, fruit bar, lettuce and chocolate milk is supposed to help children whose parents cannot afford to pay for their meals. Let’s take a closer look at what goes into this government funded meal. The iceberg lettuce was most likely grown on a megafarm, assisted with herbicides and pesticides. Large scale factory farms lobby heavily to push small farms and “unregulated” farmers out of business via burdensome regulations or unnecessary licensing. The meat, milk and cheese in the lunch are all likely from dairy cows that are housed in a Concentrated Animal Feeding Operation and fed an unnatural diet of grains to make the animal gain weight as fast as possible. The cow might potentially be fed with growth hormones. The hormones, in one fashion or another, pass through the child’s body. The packaging, dessert wrapping, and utensils are all likely produced by a factory in China. There is a good chance the factory waste will not be disposed of properly. The revenues from the sale of these goods, in some fashion, support the Communist party, which routinely suppresses free speech, civil liberties and opinions critical of the government. The shipping voyage from China burned through finite resources such as oil and gas before reaching their final destination. The corn that produced the high fructose corn syrup in the flavored milk, “fruit bar” and cherry pie most likely came from federally subsidized agribusiness enterprises. The cycle of farm subsidies, campaign contributions and re-electing those who approve farm subsidies allows the cycle of market distortion to continue. Government chooses to support certain, favored industries which hurts other producers and industries that do not receive those same subsidies. The government worker handing out this meal will potentially collect overtime for summer work and, eventually, a pension, which the city receiving this assistance has probably not fully funded. The employee, most likely a union member, will vote for whichever candidate their union has financially supported with tax dollars from the community. The government employee handing out this meal cannot provide the care, attention, and atmosphere of a loving household. The child, eating this meal, begins the slow march towards diabetes, cancer and other ailments from eating a lifetime of nutrient-devoid, heavily processed food. Having a diet so high in sugar at such a young age will likely make them less likely to choose healthier food in the long run. The wasted food and packaging will finally head to a landfill where it will rot. The annual cost to simply dispose of wasted food is around $1bn per year. To fund this program, the federal government had to borrow the money, tax its citizens or print the money. All monetary costs will most likely be paid by persons other than the beneficiaries of this program. The producers of this meal will continue to fund the production of unhealthy, environmentally damaging food. They will continue to reinvest their revenues, in some fashion, to expand their enterprise and keep this cycle going. The consumers of this meal, poor schoolchildren, will learn that free food is a right, provided for by others and not worth enjoying, savoring or preparing. The parent, absolved of their most basic responsibilities as an adult human, is shielded from the feedback loop of sacrifice, self-reliance, and caring for their young. They will not have to approach friends, family, a church, or a charitable organization to deal with their realities of being unwilling or unable to feed their own children. Every decision has consequences, both explicit and implicit. All that matters in life are our decisions. The consequences of supporting these priorities are profound. Constructive outcomes are totally avoided and destructive choices are encouraged. Attempting to help “feed poor schoolchildren” is making our world poorer, in every possible sense of the word.